Kyoto Nene House is een traditioneel Japans herenhuis en ligt in het toeristische Higashiyama-gebied van Kyoto, dat bezaaid is met enkele van de meest representatieve tempels en heiligdommen van Kyoto. Het winkelgebied in de binnenstad (Shijo-Kawaramachi) en de Kamo-rivier liggen ook op slechts 15 minuten lopen. In de buurt is een gemakkelijke toegang tot de stadsbus en taxi's van Kyoto. Beneden is er een grote volledig moderne keuken, een badkamer met douche / bad en een hoofdruimte in Japanse stijl (ruim met Japanse tuin / met breedbeeld-tv), westerse stijl toilet en een bagageruimte. De 2 slaapkamers zijn boven. De grote slaapkamer in tatami-mat in Japanse stijl in Japanse stijl is geschikt voor maximaal 6 personen met een comfortabele Japanse futon en alle kamers zijn verwarmd / voorzien van airconditioning. -Introductie gids (Engels, Frans) etc. Het duurt ongeveer 15 minuten en kost 220 yen per persoon. Neem de Kyoto City Bus # 206 en stap uit bij 'Higashiyama-Yasui'. Het duurt ongeveer 10 minuten en kost ongeveer 1200 yen. Het duurt ongeveer 10 minuten en kost 220 yen per persoon. Neem de Kyoto City Bus # 207 en stap uit bij 'Higashiyama-Yasui'. 5 minuten. loop vanaf de bushalte 'Higashiyama-Yasui'. Loop naar het zuiden op Higashi-Oji St.
Sla linksaf bij de 'Koudaiji-Minamimon-Dori' St.
Om uw reservering te behouden, is een aanbetaling van 10.000YEN vereist. De openstaande betaling kan met Paypal (creditcards) of met Contant bij aankomst worden voldaan. Kom en verblijf in ons traditionele Japanse huis in volledige privacy en ervaar het echte Kyoto. Laat Kyoto Nene House je tweede thuis worden, ontspan en verken het in je eigen tempo. 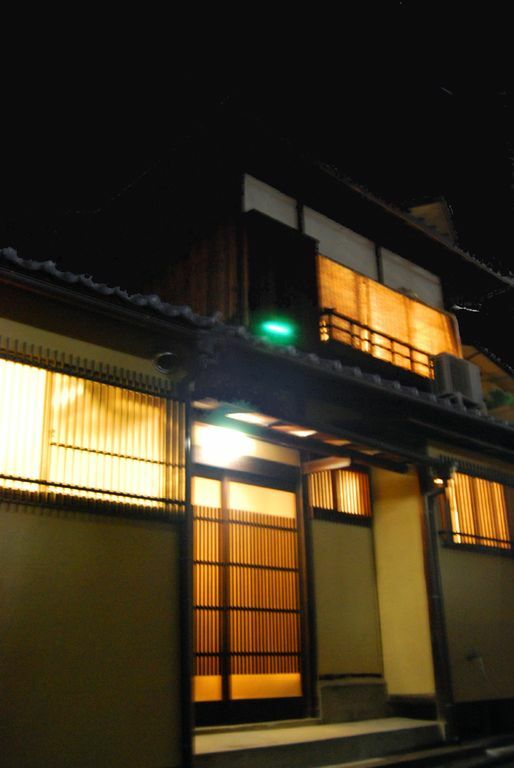 Lovely, spacious traditional home within walking distance to many Kyoto attractions. Comfy mattresses and nice warm quilts, very quiet yet right near busy tourist streets of small shops and restaurants. What a fabulous way to spend a week in Kyoto. This is a traditional-style Japanese house, with three tatami-mat rooms and stacks of futons and quilts. It has a large modern kitchen and dining area, and a Western bathroom, with a clothes washer (no dryer, but plenty of drying racks). Two of the sleeping rooms are on the upper floor, reached by a steep but manageable staircase. Somehow, even if you normally go for modern, Western-style rentals, Kyoto seems best appreciated in a traditional, yet comfortable, place like this. The house is in a mixed area of traditional houses, tourist-oriented shops, a few small restaurants (don't miss Omen ramen) and a couple of luxury hotels. At night, it's very quiet. There's a bus stop (going straight to the JR station, and connecting to everywhere else) a 10 minute walk away, and a cab stand even closer. Google maps knows where the house is, but seems to have trouble with directions (sending your taxi down a pedestrian-only street). The owners provide a detailed map, and instructions for your taxi driver in Japanese. Be sure to print it out at home. Traditional Charm and Great Location! The Kyoto Nene House was perfect for the 5 of us. It offers both a traditional feel, but with all the modern conveniences. Nobu-san met us at the house shortly after arrival and thoroughly explained how to operate the AC and everything we needed to know about the house. Nobu was also very helpful in providing a map, bus route, and lay of the local area. The house is very clean, cozy, and stocked with plenty of towels, bedding, and a fully equipped kitchen. The shower has great water pressure which is always an added plus. The location is perfect as its in walking distance to shrines, temples, and lots of shopping and food. Also within walking distance are 2 convenience stores and a 24 hour grocery store which offers a wonderful assortment of sushi/sashimi and various cooked food. It was perfect for those days when everyone wanted something different and you wanted to just eat in. I definitely recommend staying here. We loved our stay here! This is a great traditional home with all the modern convinences. Location was prefect, house was clean, bedding was plush, layout was spacious but what really made it worthy of 5 stars was Nobu. He was really clear, professional, accommodating and a great resource. Nene House is the best, with the best host! Wonderful, spacious, well-located home. Walking distance to shops, food, temples, bus. Nobusan is the best host, explaining everything, providing extra linens, extremely responsive. You can't go wrong staying here! Nobu was super helpful, meeting us late at night when we showed up from the train station. The house has all the amenities you could ever need, and it is situated in a good spot, easily walkable to Gion. We enjoyed our time there and thought the house was splendid. Andere activiteiten: Er zijn zoveel tempels en heiligdommen.